The Cabin Cuddler was invented by an airline pilot of 20 years. 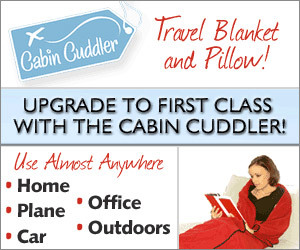 Using the Cabin Cuddler is as easy as 1, 2, 3! It keeps you warm and comfortable and has a reversible tote bag that holds both the blanket and pillow. It can be conveniently attached to your luggage and will keep you warm during your flight. You can also use it anywhere such as at home, in the car, office or even outdoors. * Never worry about germs on airline blankets again! * Great for travel and at home. * Comes with an inflatable pillow that fills quickly & easily.